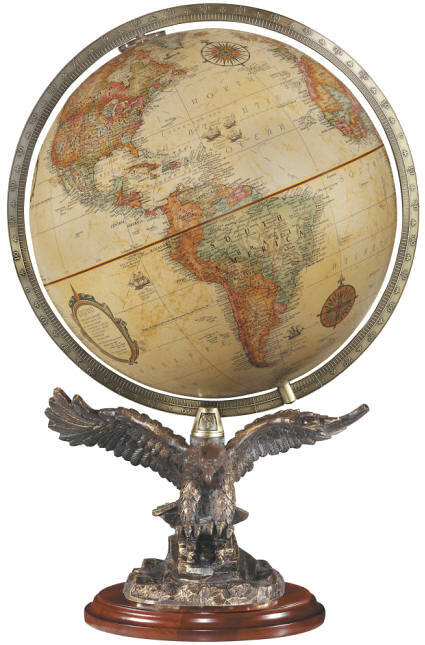 The Freedom desktop world globe showcases classic raised relief up-to-date cartography, elegant numbered die-cast meridian (ring supporting the globe sphere) and thousands of easily readable place names. Features a magnificently detailed resin eagle with bronze finish and gold accents on a wood base. Perfect gift for patriotic geography buffs. Premier Atlas Globe Atlas 12" Globe Weather Watch Leather Expedition 12"